Aloha Exchange Club President Winston Churchill, right, presents an ‘Officer of the Month’ award to officer Joseph Passmore. 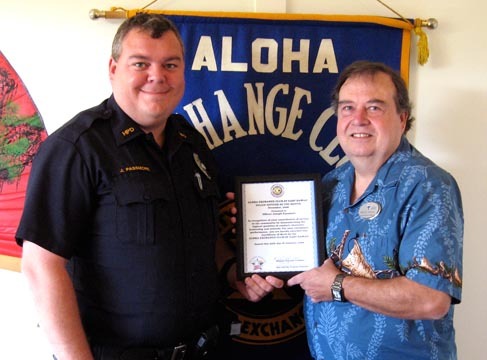 The Aloha Exchange Club of East Hawaii recognized Officer Joseph Passmore on January 22 as “Officer of the Month” for December. At a luncheon ceremony at Coqui’s Hideaway Restaurant in Hilo, Passmore was honored for volunteering to spend the entire month of November patrolling the beat that includes the Hawaiian Paradise Park subdivision in Puna. The area had experienced numerous burglaries and thefts from vacant homes and houses under construction. Just before midnight on November 8, Passmore conducted a traffic stop on a car that was driving recklessly in Hawaiian Paradise Park. The driver, a felon on parole, was arrested for several traffic offenses. Further investigation led to the recovery of stolen property from a home under construction in the subdivision, as well as to methamphetamine and marijuana in the suspect’s car. The driver and another suspect were ultimately linked to other crimes at construction sites in Paradise Park. Both Sergeant Robert Hatton and Sergeant Darrel Huston nominated Passmore for “Officer of the Month.” Hatton said Passmore had an above-average caseload and excelled in traffic enforcement during the same period. Huston said Passmore “exemplified the highest standard of professional conduct” and serves as a role model for other officers.